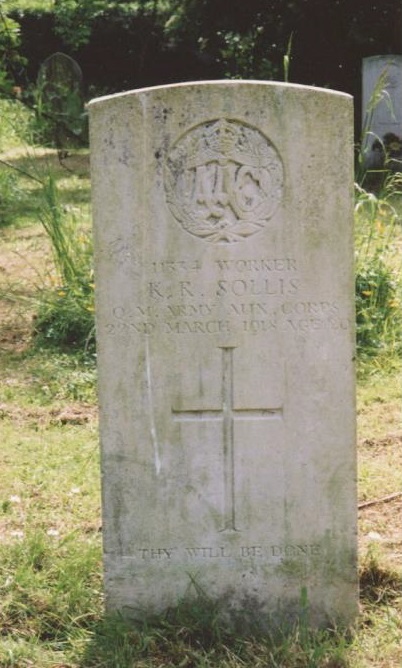 In focusing upon the ‘Kaiserschlacht’, the great German attack of 21 March 1918, attention has been taken away from a death on 22 March of Kathleen Rose Sallis - she died not on the battlefield but of influenza; she did not die in France but in her place of work, Tredington Isolation Hospital [now a prestigious housing development near the Odessa]. Ironically, she died after visiting her sick sister who was a patient in her hospital – and the sister died soon afterwards. We all know how easy it is to catch ‘flu - but rarely do we die of it. The first local soldier to die was a year earlier when Frederick W. Taylor died in Bristol, where he was serving. Both deaths highlight that it was sometimes difficult for such deaths in this country to be regarded as a war death, as neither name is included on our War Memorial. The epidemic was known as Spanish Flu [or the ‘Spanish Lady’]. It did not start there - but in the USA amongst troops in training. There was much more strict censorship in fighting countries – and Spain was not only neutral but also lost its King to the ‘Spanish Lady’. It proved to be a strange disease: it broke out in summer rather than the usual winter; it struck down young, apparently healthy people, rather than the very young or elderly and it came in two waves – the first took Kathleen but the second took eight more local men. The first of these to be lost was Philip L. Marment, who had been hospitalised in the first outbreak but had recovered to return to duty where he died at Le Havre on 31 October. His death typified the belief that it re-started in France, brought over by US soldiers, and was then returned to the UK via demobbed soldiers - who in turn infected their welcoming families. Some people recovered – famously PM Lloyd George and Kaiser Bill himself - but their constitution had not been affected by poor food and battlefield conditions. Two more died in Bristol, but three died in France - on or after the Armistice: T. Williams, A.C. Sallis and tragically CSM W.H. Price of Twyning. Not only had he survived the disease-ridden Salonika front and also won the Meritorious Service Medal but he succumbed in France. Nor were Canadian soldiers exempt: Pte. Albert Smith had survived all the many battles in which his battalion was involved but died of pneumonia after the Armistice on 21 December 1918. He is buried in a cemetery, attached to a hospital centre and rest camp: neither could save him. 228,000 people in the UK died in this ‘flu epidemic. It ended suddenly and mysteriously in early 1919. However, it is estimated that up to 50m died world-wide by the official end in December 1920. Its world-wide spread ensnared L/Cpl. Edric N. Hindmarsh who died on 23 December 1918. He is said to have died ‘in service’, probably whilst on occupation duties in defeated Turkey. He died in a Casualty Clearing Station, despite the care. Seven of these victims have had their deaths commemorated on the War Memorial but, later this year, it will be proposed that three more of these service men - and women - should have their names added to our War Memorial as victims of a war induced epidemic. They are as deserving as those who fell on the battlefield.